I thought it would be interesting to start a series on agile concepts, giving a simple definition (or at least as good as can manage) and some examples. I decided to start with the Cone of Certainty.In a technically advanced project, there’s lots of uncertainty, and we reflect that uncertainty by using lightweight, empirical methods to measure and predict progress. An example of such a method of measuring progress is velocity: we take the work the team has done, estimated using it’s level of effort in either story points or ideal hours, and then average the work done over the last few sprints to determine how much work we’re doing. Projecting that forward, we predict how much work we will probably be doing. The result is an estimate that has reasonable fidelity for this team, where they are in the project. You simply project out the velocity and use that to estimate the work the team will be able to do over time, but for a number of reasons, the accuracy of that estimate decreases the further we look into the future. That’s the cone of certainty. We’re relatively happy with using our velocity to estimate work we’re going to be doing soon, but as we look further into the future, we acknowledge that estimate becomes less and less accurate. Most of the time, the cone of certainty is simply the concept that the fidelity of your estimate decreases the further you look into the future. It’s not something that’s got real numbers, or a visual component. Some teams however choose to plot their best and worst case velocities on their burn-up charts as well as their current average, which puts some numbers around the cone. This is useful, but it’s important to remember that this is still a guess, it’s just a guess we’ve assigned numbers to. 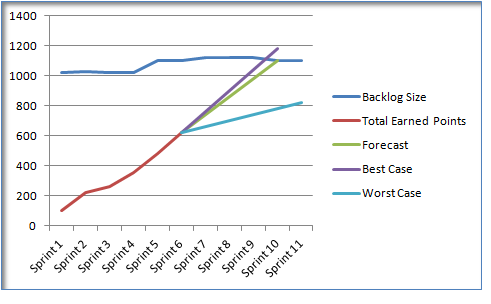 An example burn-up at the end of sprint 6, with a cone of certainty based on best and worst case velocities.